Another characteristic used to describe Costus species is whether the plant produces inflorescences at the end of leafy stems. Many Costus species will sometimes produce BOTH basal and terminal inflorescences. Costus species that sometimes have terminal inflorescences are marked "Y". Costus species that NEVER have terminal inflorescences are marked "N". If this characteristic is unknown, it is entered in the GingersRus Plant Database as "U". 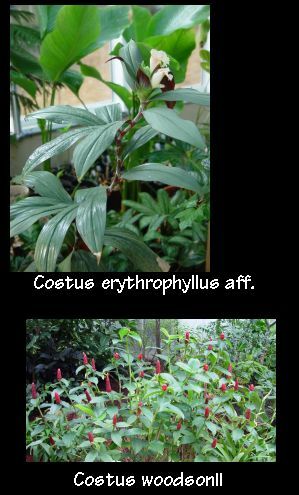 EXAMPLES OF COSTUS WITH TERMINAL INFLORESCENCE - These are pictures of Costus species with inflorescences terminal on a leafy stem.